Using damp paper towels, wipe off salmon. Squeeze fresh lemon juice over fish; ‘wash’ fish in juice and towel off. 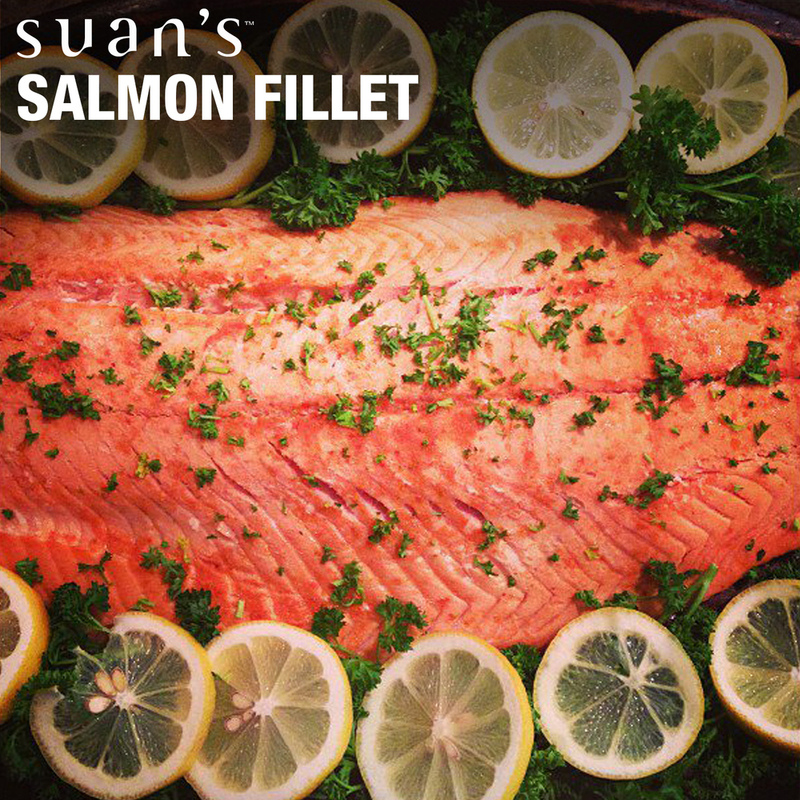 Spread Suan’s® Scotch Bonnet Flavor Sauce over salmon (amount depends on your personal taste). Place on cookie sheet and broil 3 to 5 minutes per side depending on thickness of fish. Let cool 10 minutes, remove from cookie sheet and place on platter, garnish with greens and lemon slices. In medium bowl, combine 2 to 3 tablespoons each of finely minced onion and dill pickle. Equal parts mayonnaise and sour cream, salt and pepper to taste. Add smoked paprika to taste. Cover and refrigerate until serving time. To make a perfect angel food cake, preheat oven to 250 degrees, mix cake per package directions (this is the only recipe for which I use a cake mix and I use a 2-step mix), gently fill ungreased tube cake pan with batter, run knife through batter to break-up any air pockets. Bake for 1 hour at 250 degrees, at the end of hour, turn oven up to 350 degrees and finish baking for 15 minutes. Using this method your cake will rise above the pan, having a light golden crust and be the lightest, moistest angel food cake you have ever had! Remove from oven and invert pan to cool cake, if pan does not have ‘legs’ to be raised place a slender bottle, such as empty wine bottle, in tube to hold pan upside down off counter for cooling. Allow cake to completely cool in pan before removing. Run sharp knife around edge and center tube, gently remove cake from pan, place on cake pedestal or plate, run your hands over cake to remove crumbs, wrap in plastic wrap until ready to ice or serve. Soften 3 tablespoons each butter and cream cheese. Cream together, add ¼ cup Suan’s® Scotch Bonnet Mango Lemon Fruit Butter, ½ teaspoon pure vanilla extract and ¼ teaspoon pure almond extract, mix well, start adding sifted confectioner’s sugar to desired consistency. These are just basic portions; you may add more of each ingredient to get desired quantity, if you want a glaze finish, add more of Suan’s® Scotch Bonnet Mango Lemon Fruit Butter. Serve topped with strawberries in Suan’s® Scotch Bonnet Pepper Jelly and Lemoncello Liqueur Dressing. Sliver 3 to 4 cloves of garlic. Make slices into fatty part of roast and insert slivered garlic into pockets. Add salt and pepper to taste. 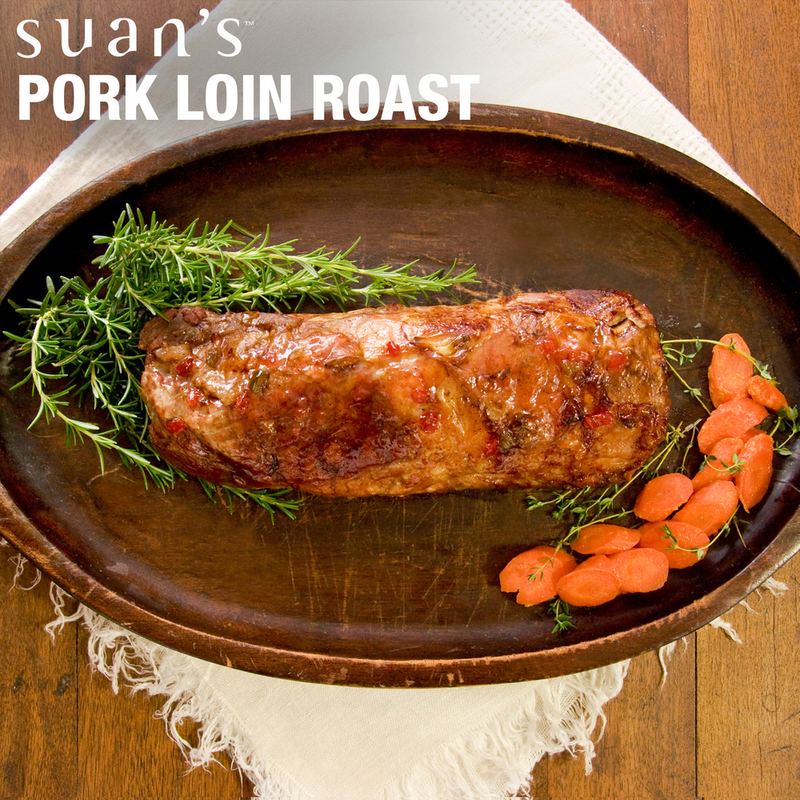 Roast for 20 minutes, remove from oven, reduce heat to 250 degrees and let roast rest for 20 minutes. Return to cooled oven and continue to roast until internal temperature reached 170 degrees. Glaze with Suan’s® Scotch Bonnet Pepper Jelly glaze every 15 minutes for the final hour of roasting. Remove from oven, and let rest 20 minutes before slicing. 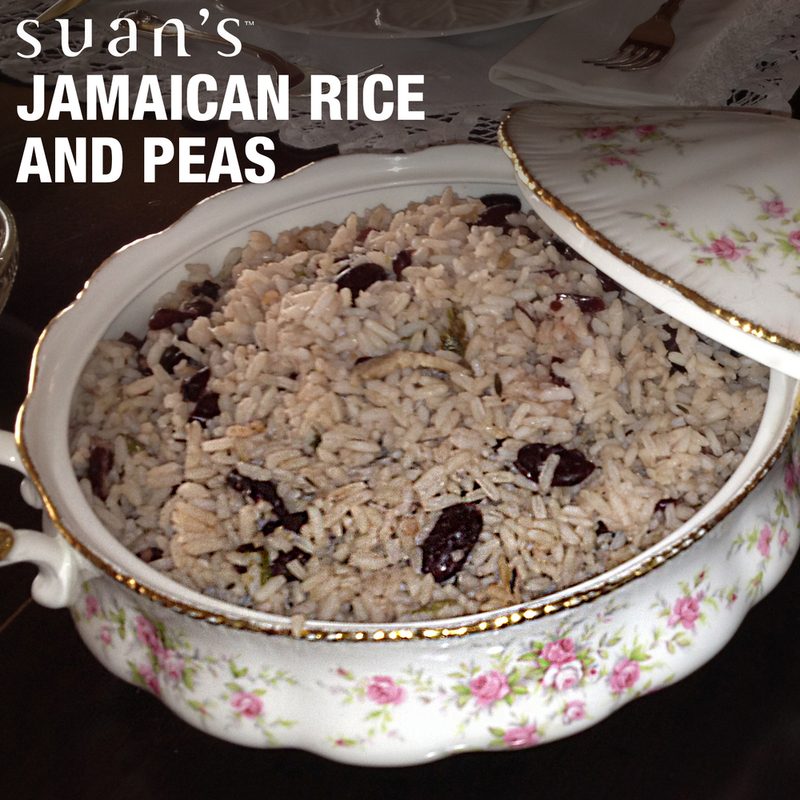 Serve with additional Suan’s® Scotch Bonnet Pepper Jelly on the side. Using damp paper towels wipe down roast, sliver 2 to 4 garlic cloves, make slits in fatty parts of roast forming pockets evenly throughout meat, press garlic into pockets, salt and pepper. Place roast in preheated oven for 15 minutes, remove from oven and let rest for 20 minutes, reduce heat to 250 degrees, return to oven for 45 to 60 minutes. 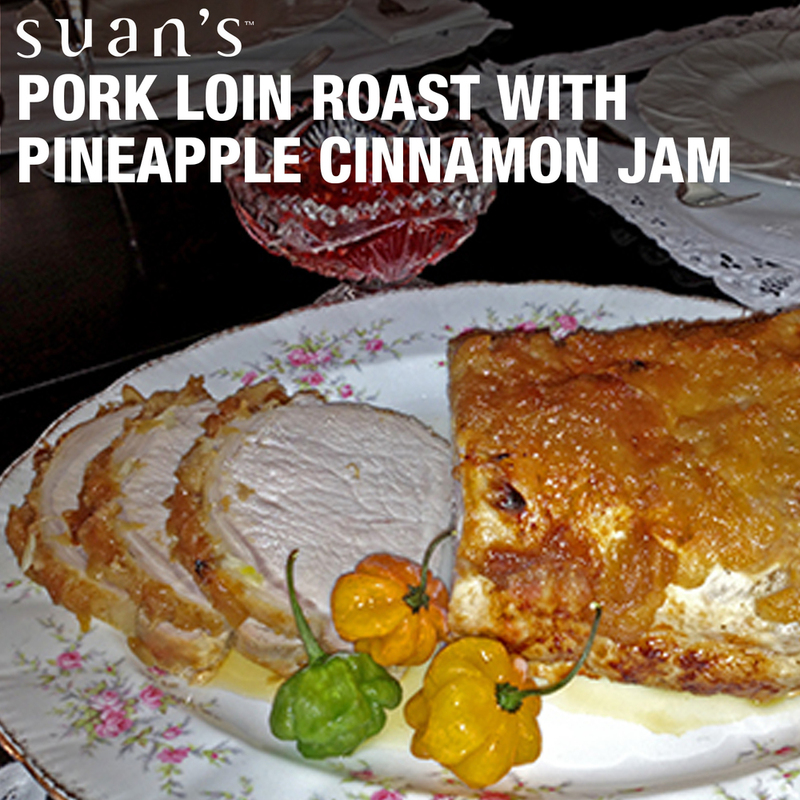 Remove from oven and slather on Suan’s® Scotch Bonnet Pineapple Cinnamon Jam, return to oven, repeat every 15 minutes until roast has reached 170 degrees on meat thermometer, remove from oven and let rest in roasting pan 20 minutes, remove from roasting pan and slice to desired thickness. Quickly heat drippings in roasting pans and serve on the side. For added flavor and heat add Suan’s® Scotch Bonnet Flavor Sauce to Suan’s® Scotch Bonnet Pineapple Cinnamon Jam to taste. Prepare mixed berries, mix 2 tablespoons Suan’s® Scotch Bonnet Pepper Jelly with 1 tablespoon Lemoncello Liquor or lemonade. Pour over mixed berries, toss gently. Serve with a dollop of whipped cream. 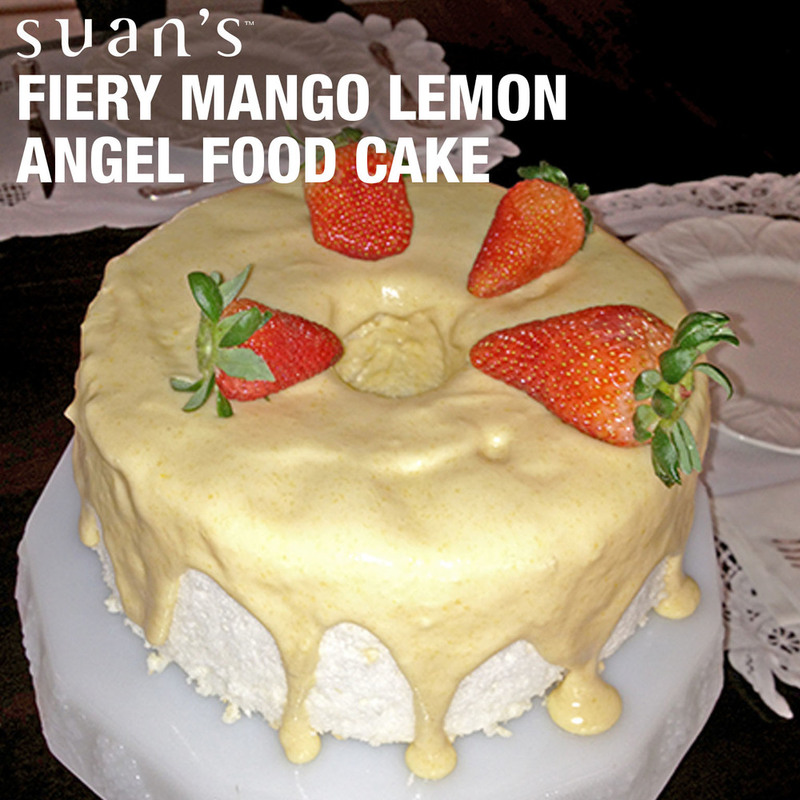 Serve over Suan's Fiery Angel Food Cake for an extra special treat!